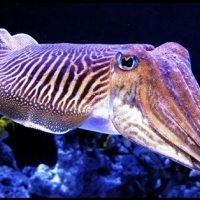 Cuttlefish are marine animals belonging to the class Cephalopoda, which also includes squids, octopuses, and nautiluses. Despite their name, cuttlefish are not fish but mollusks. Cuttlefish are real masters of disguise-able to change their appearance at will. With no internal skeleton, they can mold their bodies into all sorts of strange shapes and sizes. Their skin is packed with chromatophores, enabling them to change their color too. This lets them camouflage themselves and also communicate with other members of their species. Like most cephalopods, they are intelligent and curious creatures, with a large brain-to-body ratio. The cuttlebone, for which they are named, is a gas-filled shell inside the mantle, which helps them regulate their buoyancy. Cuttlefish can be found around in coastal areas of all tropical and temperate oceans, except the Americas. Their preference is for shallow waters, especially sandy sea beds where they can hide.